Both proponents and critics of the current flawed and outdated Sudan sanctions program agree that this policy has not precipitated the fundamental changes needed to bring about lasting peace and stability in Sudan. On its own, the five-track plan does not achieve this goal either. While the plan encompasses several critical issues, it does not get at the heart of what ails Sudan: a violent kleptocratic system that excludes many Sudanese people, especially those in periphery areas, and is the source of immense suffering. 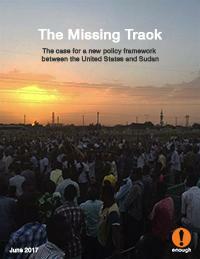 Regardless of the decision on the five tracks in July (which Enough analyzes in a separate policy brief), it is imperative that the Trump administration, in collaboration with Congress and the broader international community, seek to directly address the Sudanese regime’s governance failures and support the opening of political space that Sudanese actors can fill. The best chance to do so is through a new diplomatic initiative that builds on, but is not directly connected to, the current five-track plan. In order to address the fundamental issues producing violence and state dysfunction in Sudan, the Trump administration should immediately design and enact a new track of engagement with Khartoum that is focused on peace and human rights. This new track should be tied to a new set of smart, modernized sanctions that spare the Sudanese public and target those who are most responsible for grand corruption and atrocities, including air strikes on villages, attacks on places of worship, obstruction of humanitarian aid, jailing and torturing opposition figures and civil society leaders, and undermining peace efforts. A modernized U.S.-led strategy of meaningful financial pressure would draw on valuable lessons from other higher profile cases and utilize a combination of network sanctions—meaning the targeting of not just a few individuals for sanctions, but also their business associates, facilitators, and the companies they own or control—with anti-money laundering measures designed to freeze those most responsible for violence and corruption in Sudan out of the international financial system altogether. This new track for peace and human rights should also be tied to new incentives for the Sudanese government, including reconsideration of Sudan’s inclusion on the list of State Sponsors of Terrorism (SST), should Sudan meet certain transformational benchmarks. Initiating this new track for peace and human rights would be a significant undertaking that would require a substantial investment of diplomatic capital, consistent congressional involvement and oversight, and strong multilateral coordination—but it offers the best chance to directly address the core drivers of Sudan’s instability and to open political space that allows Sudanese people to push for genuine reform. [i] U.S. President (Barack Obama), Executive Order 13761, “Recognizing Positive Actions by the Government of Sudan and Providing for the Revocation of Certain Sudan-Related Sanctions,” January 13, 2017, available at https://obamawhitehouse.archives.gov/the-press-office/2017/01/13/executive-order-recognizing-positive-actions-government-sudan-and.